A’ Famosa Resort takes its name from the 16th Century Portuguese fort in Melaka. The resort itself is just outside the city, and around 1 and a half hours drive from Kuala Lumpur. Accommodation is provided across two on site hotels and a large number of private villas, in a mock-Colonial style. Rooms are spacious and light and airy, with many affording lovely views over the surrounding countryside. The Safari Wonderland gives visitors the opportunity to see animals both exotic and domestic. Petting the rabbits might be excellent fun but we wouldn’t recommend getting to close to the lions and tigers. A special boat takes visitors to Monkey Island, in the centre of a lake, or go see the Farm House with an astonishing variety of chickens. Get A’Famosa Safari Wonderland Tickets Now! Get A’Famosa Water Theme Park Tickets Now! The Water Park is split into 3 sections, with an Arabian Village set in a swimming pool for the children, sandy beaches for the adults, and adventurous water slides and rides for those feeling brave. The Old West comes alive at night with a recreated Wild West town, complete with battling Cowboys and Indians. A range of outdoor sports, from archery and paint balling to basketball and horse riding, are available throughout the resort. There is a premium golf course as the resort’s sporting centrepiece. Souvenir shops and themed dining options are dotted throughout the attractions, but the big draw for retail and eateries is the Freeport A’ Famosa Outlet. 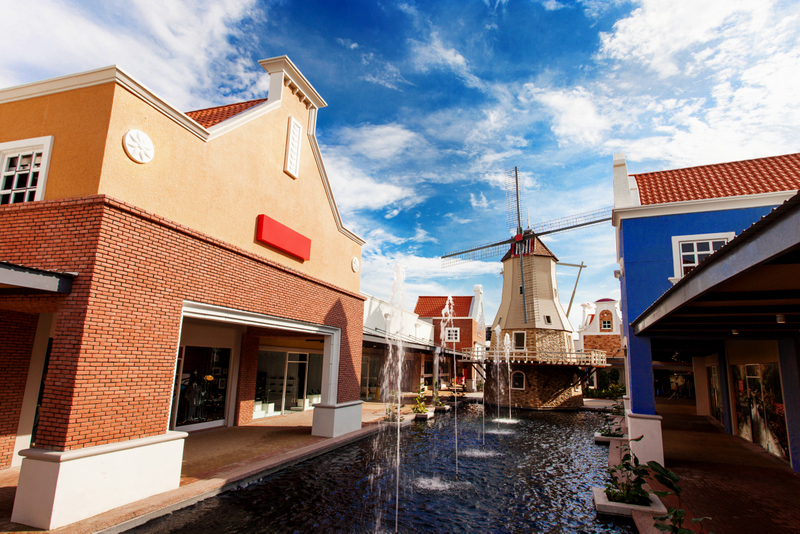 With up to 80% discount on well known brands, this outlet shopping centre is a retail paradise, beautifully presented replica Dutch buildings. There is even a windmill. The A’ Famosa Resort caters for all tastes to provide a fun-filled family holiday.